The Intricate Lattice stitch is an intricate openwork stitch that is knitted in a multiple of 6 stitches plus 1 and is an 8-row repeat. Like most lace stitch patterns, this stitch has excellent drape qualities and blocking is highly recommended for optimal results. 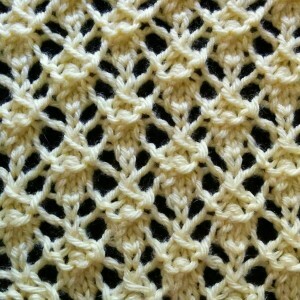 The Intricate Lattice stitch works great on many types of projects such as shawls, scarves, bags and more! Row 1 (RS): k1, *yo, p1, p3tog, p1, yo, k1; rep from * to the end. Row 3: k2, yo, sl 1, k2tog, psso, yo, *k3, yo, sl 1, k2tog, psso, yo; rep from * to the last 2 sts, k2. Row 5: p2tog, p1, yo, k1, yo, p1, *p3tog, p1, yo, k1, yo, p1; rep from * to the last 2 sts, p2tog. Row 7: k2tog, yo, k3, yo, *sl 1, k2tog, psso, yo, k3, yo; rep from * to last 2 sts, sl 1, k1, psso.